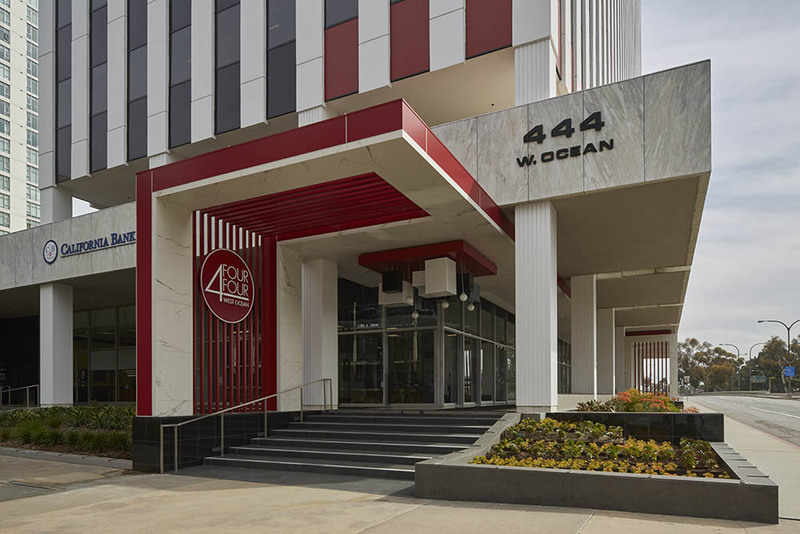 Built in 1967, 444 West Ocean in Downtown Long Beach was calling for a major renovation in order to meet today’s changing business market needs and tenant expectations. The goal was to not only elevate the building’s brand in the local market, but also to introduce a creative and truly differentiating design aesthetic that would appeal to a broader spectrum of prospective tenants and their employees. Given the building’s mid-century roots as well as the market’s growing appreciation for modern design and collaborative spaces, the big idea was to recast the building as one that expresses a timeless new take on the mid-century modern style. The renovation of 444 West Ocean was extensive, including many cosmetic enhancements as well as a number of behind-the-scenes mechanical upgrades. The building’s lobby is a clean and contemporary space featuring retro light fixtures as well as a signature ‘60s-era phone booth that is actually an aquarium teeming with tropical fish. 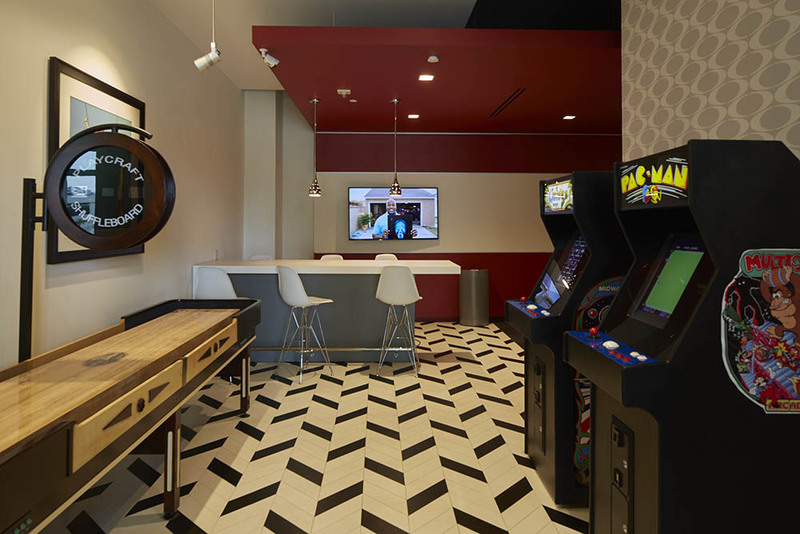 The adjacent Club Room is a private lounge for the tenants with flat-screen TVs, free WiFi, comfortable couches, American shuffleboard and retro arcade games such as Pac-Man. Meeting the need for creative environments that fuse work with places to collaborate or just relax, the Club Room is an inspiring place to have a break, socialize with colleagues, play video games, or even kick back with a laptop and conduct work. Creativity continues on the floors above, where Mad Men-esque placards adorn the doors of the men’s and women’s restrooms and modern art is featured in the corridors. In the underground parking garage, a graphic artist was commissioned to create bold, colorful wall graphics in a ‘60s style. The much-loved Long Beach coffee purveyor and eatery, Aroma di Roma Café, has opened Aroma di Roma Centro, which occupies the ground-floor space adjacent to the Club Room. The café adjoins yet another creative space away from the office, including a laid-back urban terrace complete with a low-profile, outdoor fire-pit encircled by colorful sofas and patio furniture imported from Italy. 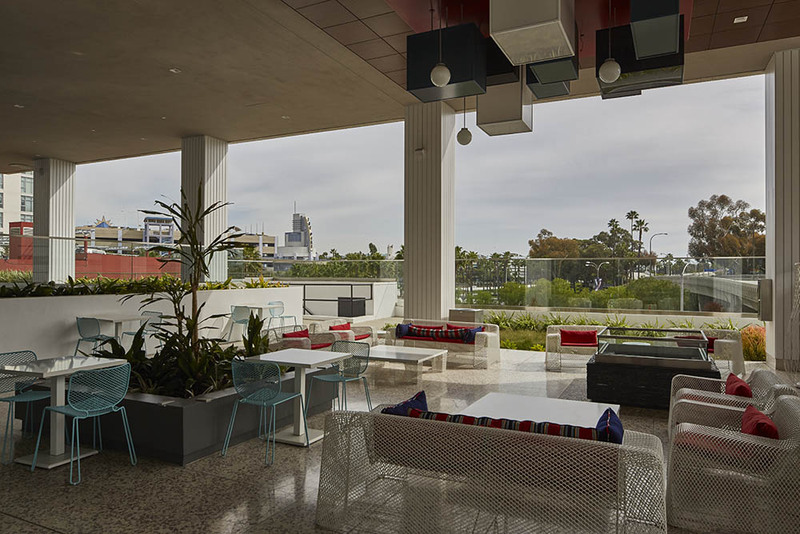 A bold transformation two years in the making, the new 444 West Ocean is clearly resonating with the broader market—from traditional companies such as lawyers and shipping firms, to the full spectrum of creative businesses driving Southern California’s economy. According to a recent real estate report, the Downtown Long Beach Class B absorption rate totaled 34,000 square feet for the city in 2015—with 27,000 square feet of it attributed to 444 West Ocean.